This Chicken Croquettes ( Cutlets) recipe is a creative way of making a new meal out of leftover chicken, or turkey meat. First night we have the roasted meat, next day I make Chicken Salad, or Chicken Pot Pie, out of half of the leftover meat. On the third day I am still able to make these Chicken Croquettes (Cutlets), which I usually end up freezing, because who wants to eat chicken for three days straight. I use the leftover bones (with some remnants of meat on them), plus the leftover juices in the roasting pan, and some vegetables, to prepare a great soup stock. You can even freeze it for later use, or make it into a tomato, or vegetable soup. This recipe yields 4-6 medium size croquettes. Heat 2 Tbs. of canola oil in a saucepan. Add chopped onions, shredded carrot, and chopped celery. Add minced garlic and sauté one more minute. Remove vegetables from the pan and add to chopped up chicken. Add 2 Tbs. canola oil to the sauce pan, heat again. Add 2 Tbs. flour, and sauté, stirring constantly, until slightly golden. Add ¼ cup of water, bring to boil, and continue to mix. Add chopped parsley, egg, salt and pepper to taste. Dip both sides in seasoned bread crumbs. Let rest for a few minutes, until the oil is ready for frying. Fry lightly 5 minutes per side. 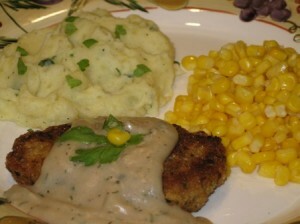 I serve these croquettes with garlic and parsley mashed potatoes, home made gravy, and a fresh vegetable. Great way to use up that leftover turkey meat from your Thanksgiving feast, or that rotisserie chicken you had the night before.